These tickets may include an e-badge but WILL NOT GUARANTEE A BAG.You will have to bring your own food/go out for lunch, but drinks will be provided. We will be unable to add in additional food with the caterers with such short notice, so meals will not be included. What do you get then? You will be able to attend this year with the amazing lineup of speakers and demos. You will get one of the e-ink badges, and any of the extra goodie bags that aren't otherwise claimed by the social hour. 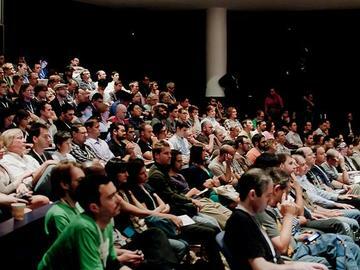 2013 Open Hardware Summit is September 6, 2013 at MIT's Kresge Auditorium. OSHWA Members: You receive 10% off of your Summit Ticket. (Some OSHWA membership levels also include complimentary tickets to OHS.) In addition you will receive reserved and priority seats at the Summit. Please email us at info@oshwa.org if you did not receive your registration code already by email. If you'd like to become an OSHWA member and receive the registration discount for the 2013 Summit, you can do so here.